Last Sunday I read some poems at the Pine Lake Poetry Festival, organized by poet Lynn Alexander. Pine Lake is a neighborhood in metro Atlanta with a small lake (more of a pond, really). Funky, artistic houses circle the lake, and along a side street vendors set up their arts and crafts and funnel cakes. The poetry reading took place at the gazebo. Lots of love and friendship was generated. Thanks to the Tampa Review for including my poem “Perimeter Shopping Trip” in their latest issue, number 45/46. It’s a gorgeous, hardbound book filled with lovely poems and artwork, and I’m very happy to have my poem alongside such gems. 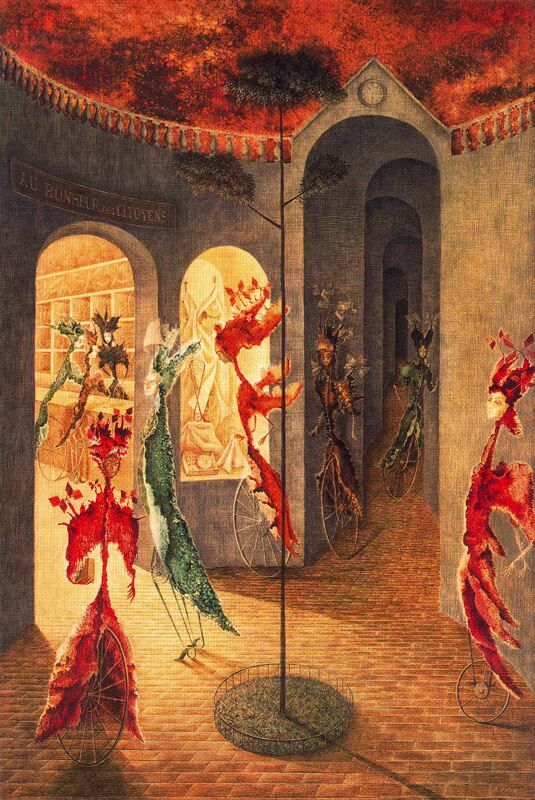 Although the poem stands on its own, I’m posting the painting I wrote to, Au bonheur des dames by Remedios Varo. She in turn was writing to the novel by the same title by Emile Zola. A labyrinth of inspirations. I love Remedios Varo’s work! I happened upon La Ruptura a few months back and am now reading her biography. Congratulations on your publication, and thanks for sharing your inspiration behind this poem. I looove Tampa Review….whenever you are in Tampa, you gotta-gotta see University of Tampa, and the silver turrets of the college, the JFK statue (verrry timely, this!) which was erected as an homage to his drive through Tampa, just four days before he was assassinated in Dallas…. I’m now excited to learn more, about your inspiration/muse here….